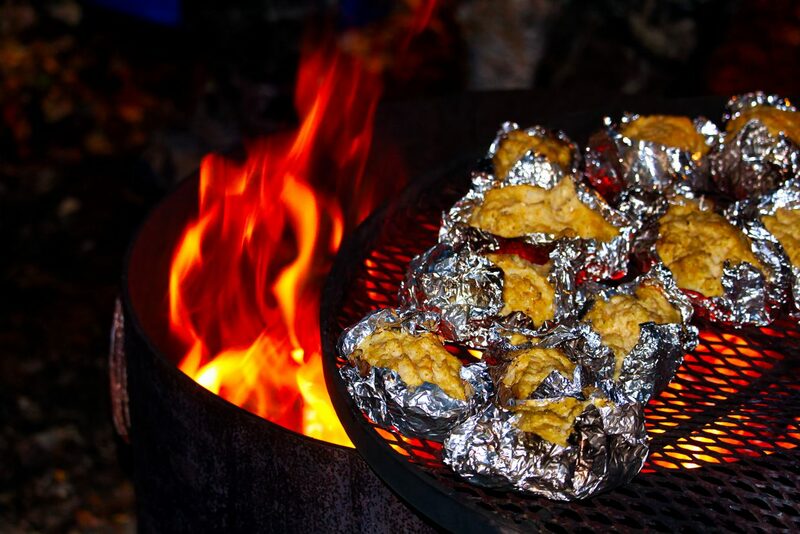 Making stuffed baked potatoes at night on a campfire. From potatoes to fish, eating healthy while camping is as easy as grabbing some tin foil, a little oil, and spices. Ray offered the following four simple recipes for preparing healthy camp cuisine. • Hominy Hobo Packet: Place two cups of chopped, raw, nonstarchy vegetables in the center of the foil. Top with a half cup of cooked or low-sodium canned black beans, three-quarters a cup of canned hominy (drained and rinsed), and a heavy sprinkling of chili powder. Seal the packet, and cook over medium heat for about 20 to 25 minutes, until the vegetables are tender. Top with two tablespoons of ripe avocado and one tablespoon of reduced-fat sour cream. • Meat Lovers Campfire Fiesta: Place two cups of chopped, raw, nonstarchy vegetables in the center of the foil. Top with two ounces of southwest-seasoned, cooked ground beef and eight chopped black olives. Cut one six-inch corn tortilla into half-inch-wide strips. Arrange the strips around the beef and vegetable mixture to resemble a campfire. Place one-quarter cup of salsa in the center of the strips to make the “fire.” Seal the packet, and cook over medium heat for about 20 to 25 minutes, until vegetables are tender. • Grilled Apple Cheddar Snack Sandwiches: Core one small apple, and slice it horizontally into six rings. Divide one ounce of reduced-fat shredded cheddar cheese into three parts. Sprinkle one-third of the cheese onto each of the three apple rings. Place the remaining three rings on top of the cheese rings to make three sandwiches. Stack all three sandwiches together in the center of the foil. Seal the packet, and cook over medium heat for about 20 minutes, until the apple rings are roasted and the cheese is melted. • Jammin’ Peaches: Slice one ripe medium peach in half, and remove the pit. Place the halves in the center of the foil with the flesh side up. Spread each half with one teaspoon of no-sugar-added blackberry jam. Sprinkle two tablespoons of granola on each half (a total of one-quarter cup of granola). Seal the packet, and cook over medium heat for 20 minutes. 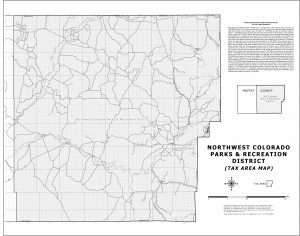 Before cooking over an open flame this summer, be sure to check current fire restrictions and campground rules, as drought conditions have led to restrictions on campfires in many areas.